The weather has been improving on a daily basis this past four days or so and, though we look set to get something of a deterioration shortly, it has certainly been nice enough to get people outside and looking for birds. 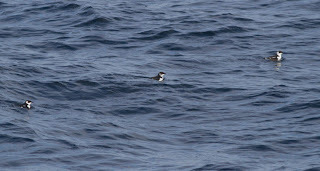 Sunday proved to be a short-lived wonderment of early arriving migrants as Monday failed to come up with the goods. The best that Tony Leukering and I could muster was a nice count of 41 Tree Swallows and one Barn Swallow at Tarkiln Pond. Interestingly, not a single Ring-necked Duck remained from the day before, so they are certainly on the move now. Belatedly, I hear that at least six Snow Buntings remain on the beach at the state park so do keep an eye out for them. I came back to the office today to a nice mixed bag of emails, many of which contained some great photo highlights from the weekend, so here's a few of them. 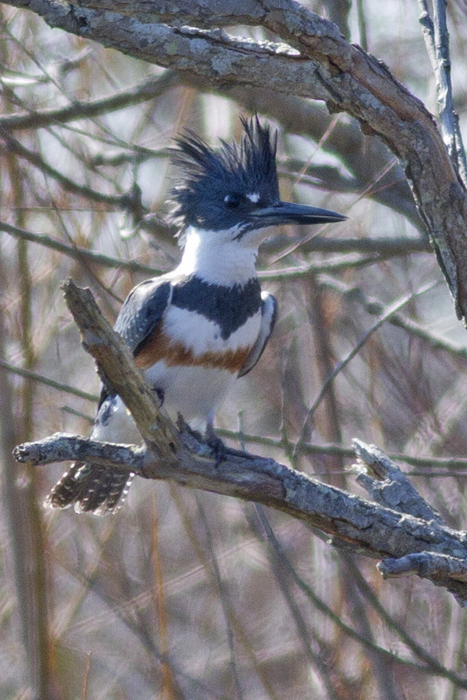 Belted Kingfishers are becoming more noticeable now as they return to favored ponds in our area. Several sites currently hold noisy, calling birds, including this one at The Beanery [photo by Sam Galick]. 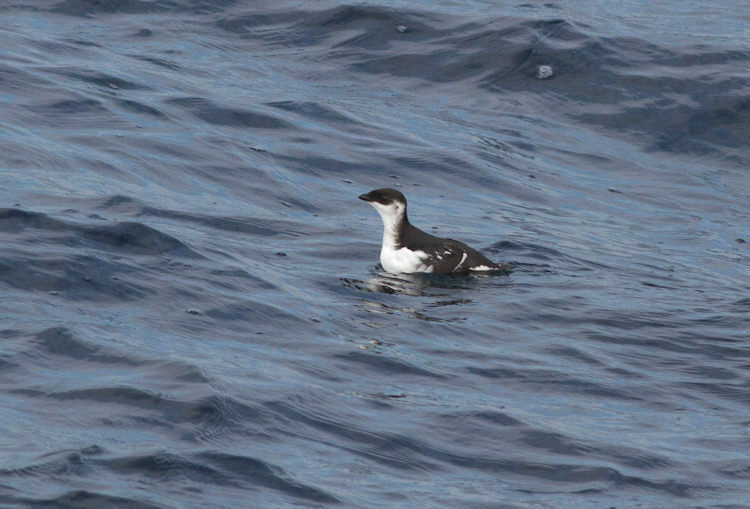 I was surprised to receive this picture from Karl Lukens as I had no idea that this bird was still around! 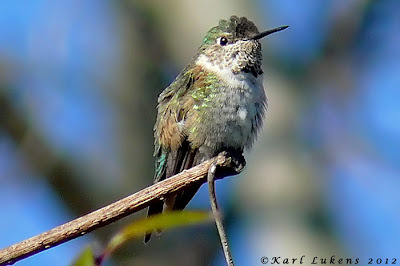 It's the Selasphorus hummingbird from Batts Lane, off New England Road (taken on 26th) which has presumably been present all winter now. Tony Leukering and I had one of our 'up-county' adventures on Monday and our findings included this fabulous Eastern Red Bat. We watched it for some 20 minutes, hawking insects along a dirt road in bright sunshine and Tony's superior equipment to mine (and superior skills of course!) ensured he outshone me with these awesome photos. 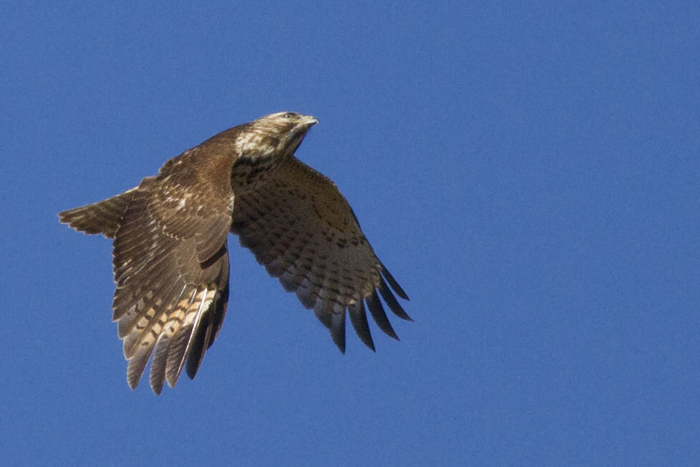 We eventually lost the bat when a Sharp-shinned Hawk swung in to catch it. We managed to scare the hawk off (I know, I know, interfering with nature etc. etc. etc!) 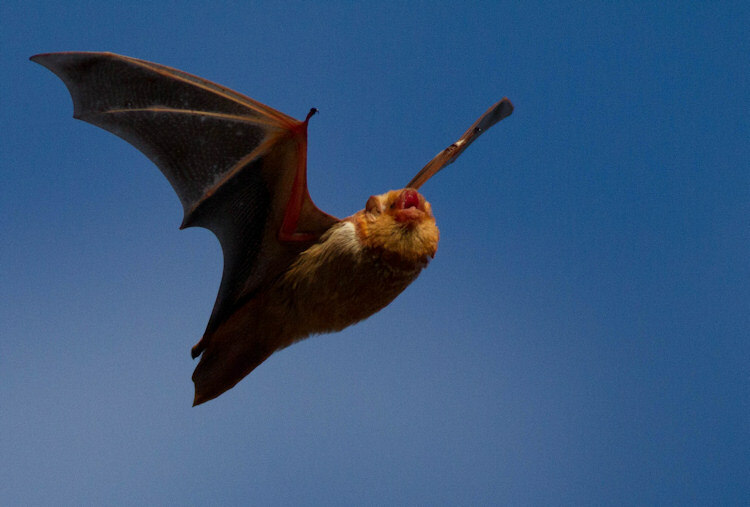 but the bat decided it was time to head off elsewhere. SPRING!!! Really? Are you sure? What a strange year this is already turning out to be. 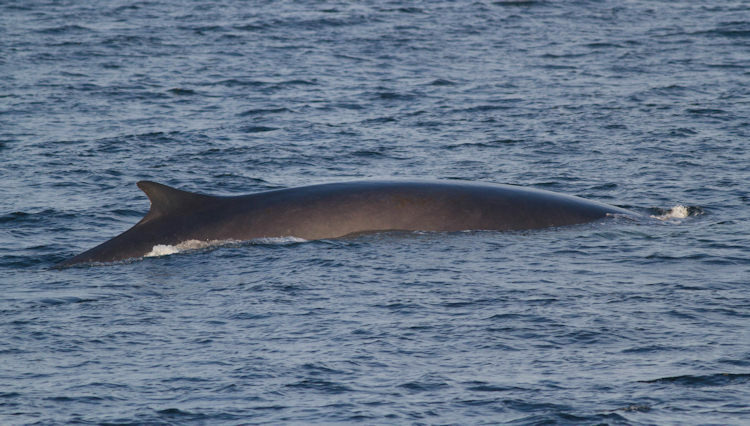 A remarkably mild winter has produced some fascinating sightings already - and today maybe really laid down the foundation upon which an exceptionally interesting spring may be built. Don Freiday kicked off the 'Best Bird of the Year' competition with the discovery at 2:30pm of a Western Grebe on the Delaware Bay, floating quite quickly southward past the ferry terminal on an out-going tide. Many local birders managed to get at least some sort of a glimpse until the bird was eventually lost to sight well south of St Peter's, off Cape May Point. Perhaps this bird wasn't quite so unexpected, as there has been a Western Grebe on the Delaware off Lewes for some time now and perhaps this may even be the same bird. 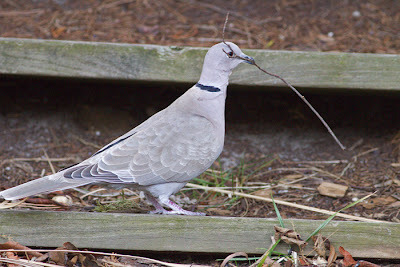 But it's still a great find for Cape May County and, if it passes muster through official channels, it may well become the first, multi-observer, fully documented record for the county. Though a great highlight of the day, this bird was actually the icing on the cake after what had been an action-packed morning. Roger and Kathy Horn walked the Rea Farm and turned up a whole host of great birds, including a singing Eastern Meadowlark, Horned Lark, Eastern Phoebe, Rusty Blackbird and Wood Duck, but the real startler was a Barn Swallow seen at the Willow Pond. I haven't yet had time to research more recent records, but Sibley's Birds of Cape May lists March 9th as the earliest date for Cape May for Barn Swallow so this is a really noteworthy find. Perhaps equally noteworthy was a female Purple Martin at the point, seen on several occasions around the state park/St. Mary's/Coral Avenue area. 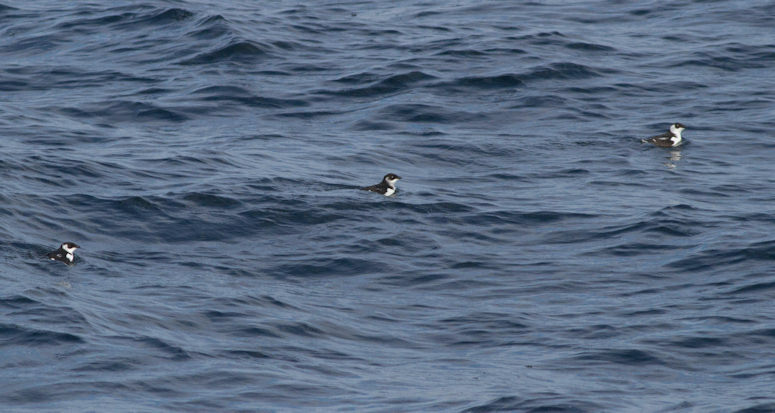 Though the date is not a record-early one (Sibley gives February 22nd), what is very surprising is that today's bird was a female. Typically, male Purple Martins head north first, often arriving around 10 days ahead of the females, so this bird was a real surprise. Yesterday had produced reports of several Tree Swallows, including at least six at the point and five at Beaver Dam in South Dennis, so a few more today was perhaps not too surprising. Karen and Brian Johnson reported nine Tree Swallows (as well as 150 Ring-necked Ducks) at Tarkiln Pond on Weatherby Road today - a site not much visited this time of year. 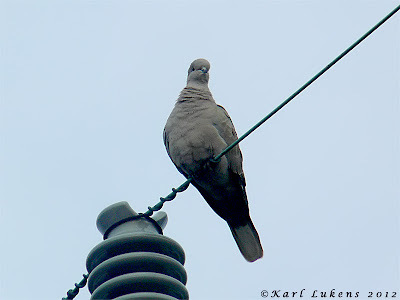 Also up at the 'top end', a male Eurasian Wigeon was reported from the Corbin City section of Tuckahoe WMA. Finally, (though actually reported first today!) a Pine Warbler was at Cox Hall Creek WMA. Aside from birds, other sightings were a little thin today as, despite cloudless blue skies, a chilly wind kept temperatures lower than had been hoped. Nevertheless, Wood Frogs were in evidence at Beaver Dam and both Mourning Cloak and Orange Sulphur were noted at the Rea Farm. 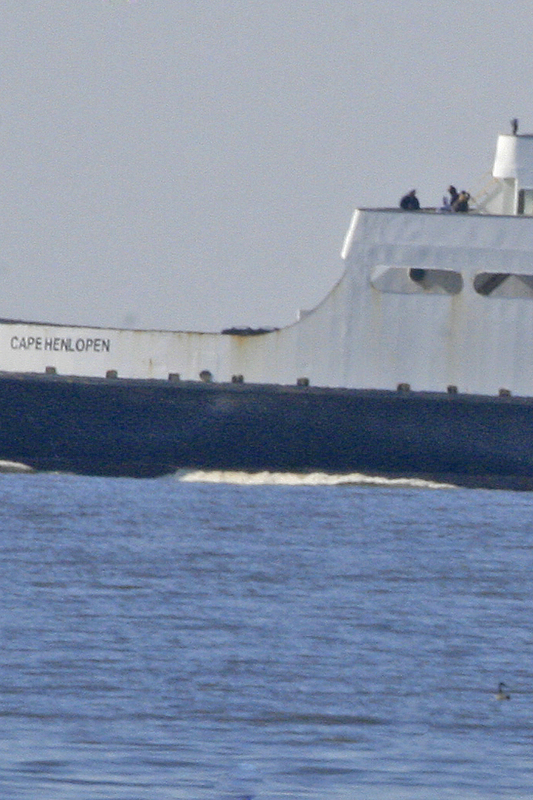 Just to put it into context - spot the Western Grebe (bottom right corner) with the Cape May-Lewes ferry passing by! [Photo by Mike Crewe] A fine example of how a 400mm lens can't compete with the viewing power of a good scope, which gave me roughly the equivalent of a 6000mm lens so allowed for better views than could be achieved through the camera! Top tip for tomorrow? Laughing Gull at the ferry terminal or Miami Beach - I'm guessing that's why Don was there today!! The past week has seen a continuation for a number of wintering individuals around Cape May Point, including the Glossy Ibis, male Eurasian Wigeon and Cackling Goose - with perhaps two of the latter around. A little further afield - but not by much! 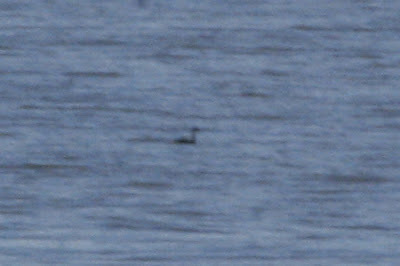 - I hear that the Western Grebe is still present (to 21st at least) near the ferry terminal at Lewes, Delaware. If only the curve of the earth didn't prevent us from scoping it from here! The first 'new' bird of note came on February 22nd with a male Wood Duck on lake Lily, reported by Karl Lukens - and duly scoped from the Northwood Center. With spring not too far away now (see below!) attention is rapidly turning to the Bayshore side of the peninsula and regular checks at Miami Beach by several observers have turned up a Black-headed Gull there, as well as a rather surprising count of 66 Red Knot there on 23rd. The weather is see-sawing a little at the moment and, though continuing relatively mild, gray skies and light rain are currently slowing things a little. Northern Gannets and Red-throated Loons are starting to build off Sunset Beach I hear, the female Dickcissel has been more co-operative and enjoyed by several visitors at the Northwood Center today and the female Rufous Hummingbird still hangs out up at Goshen. But the forecast for the weekend doesn't look too bad, especially Sunday, so let's see what the weekend brings! 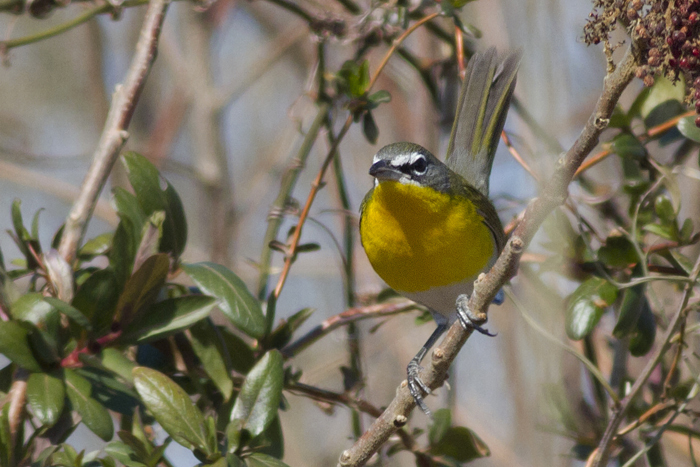 This photo from Beth Polvino, taken at the state park on 21st, alerted me to the fact that the overwintering Yellow-breasted Chat is still present there. I hadn't heard of any sightings of it for a while but looks as though it is still finding plenty of Winged Sumac fruits to eat! 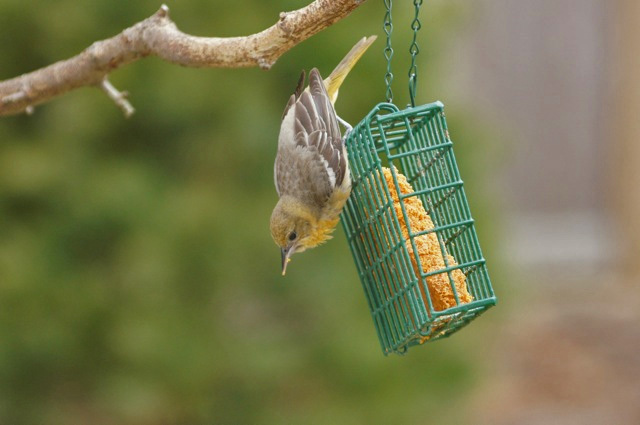 From West Creek, up near Tuckerton, Wayne Morley sent me this great picture of a Baltimore Oriole that has been coming to his suet block this winter. It's been a good winter for this species in South Jersey with a higher than average number of sightings throughout the last three months or so. What I want to know though is how come Wayne gets an oriole at his suet block and I just get starlings and grackles?! My recent post about leucistic birds, prompted Cindy Ferguson to send me these photos of a leucistic Dunlin that she found at Stone harbor last weekend. 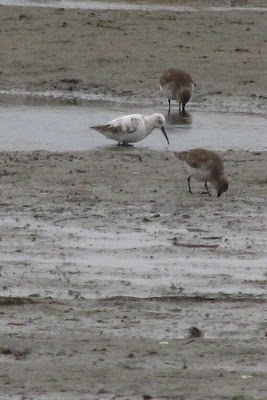 Shorebirds can be tough at the best of times, but when they do this to you it really isn't playing by the rules!! Such birds needn't be too tough though and this individual is helpful in not sporting a combination of colors and markings that would make it confuseable with anything else. 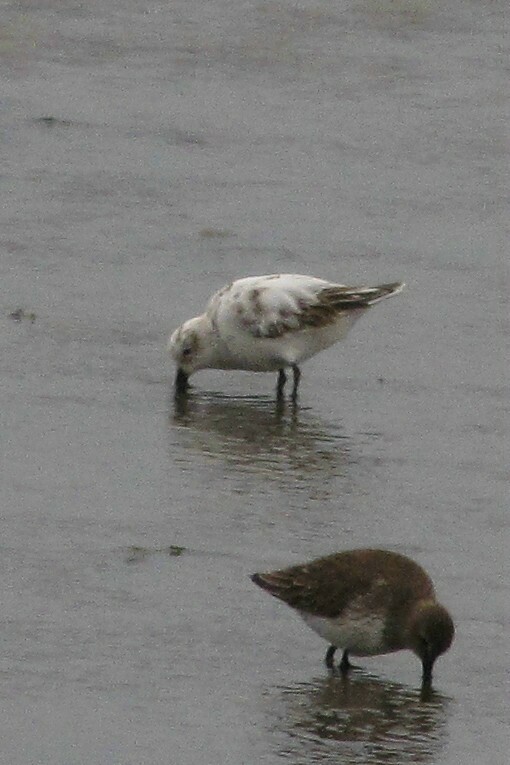 The overall whiteness might make you think of Sanderling, but the brownish rather than grayish or black wing feathers, coupled with that all too long bill soon put that species out of the frame. ... while this Blueberry Azure, photographed by Will Kerling at Beaver Dam in South Denis on 23rd, sets another new earliest date for Cape May County. Late February is about the time we would normally expect to start listening for the first frog chorus of spring, so their appearance now is not so surprising. I have been told of Southern Leopard Frogs and Spring Peepers starting to call in the county now, while Will Kerling photographed this Wood Frog (one of three he saw) in South Denis yesterday. On a slightly different note, Keith Seager mentioned to me that he had seen Fiddler Crabs at Higbee Beach yesterday. I don't know much about the timing of fiddler crabs and their movements but I wouldn't be surprised if this wasn't an early date too. Will Kerling was a very happy person this lunchtime and I was there to see it. Having doggedly followed Orange Sulphur butterflies right through this mild winter that we have been having, we got to the point of wondering whether last year's crop of Orange Sulphurs would make it right through until this year's adults started arriving from the south. Well, today we got our answer, for today, Will pulled up sharply as we were walking across a grassy field and pointed out to me an Orange Sulphur. Not that surprising up to this point as we were at this field for the very reason that we had been seeing Orange Sulphurs there regularly through the winter on sunny days. The big surprise came when I got in close for photos and discovered that this was something new. This was a freshly-emerged female with wings that hadn't even finished drying out after emergence from the chrysalis. This was to become the first New Jersey butterfly of 2012. Not one that had survived from last year, it had emerged in 2012 - today! To put this into context, Glassberg's Butterflies Through Binoculars: The East lists Orange Sulphur flight times as beginning in late March for North Carolina and mid April for New York. Freshly-emerged female Orange Sulphur. 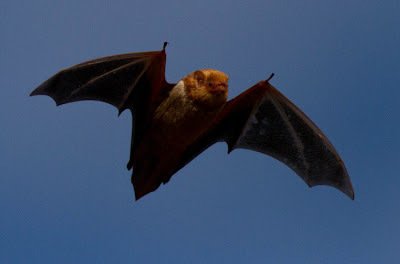 The edges of the wings look corrugated and soft as the veins haven't dried out and hardened yet [photo by Mike Crewe]. This early-emerged Orange Sulphur would be reason enough to celebrate today, but even better was to come! On an old railbed nearby and just a short time later, we flushed a small, dark butterfly. We thought of Jimmy Dowdell's American Snout that had been seen not far away in January, but a pale line across the wing like a tiny Red-shouldered Hawk gave it away - a Common Buckeye. A Common Buckeye? 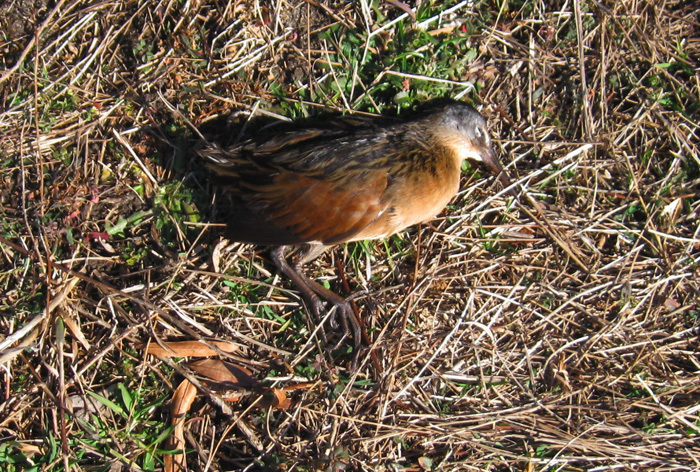 This species is not known to overwinter regularly north of south Georgia. The butterfly landed and we were even more amazed. This wasn't a worn butterfly that had successfully kept itself fed through a mild winter. This wasn't even a reasonably fresh butterfly that had pushed up very early from the deep south. This was a crisp, slightly bendy-winged (just like our sulphur) just emerged locally from the chrysalis individual! A truly amazing find and, as far as we know, the first ever record of this species in New Jersey in February. Will was over the moon; have you ever seen a grown man skipping? It's not a pretty sight!! Topside and underside of today's Common Buckeye. 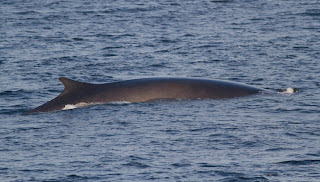 Typically for an individual that has been through cold conditions, it was very much on the small side and washed with dark colors. 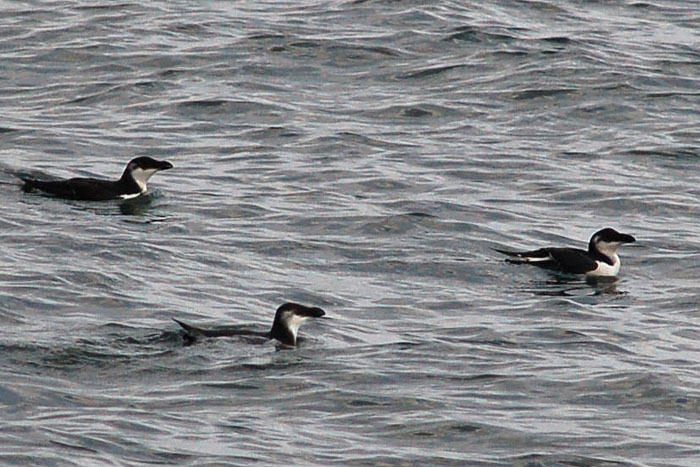 In the top picture, note also the atypical spot patterning on the hind wing. Common Buckeyes usually only have two eye spots on each wing (the largest of which is hidden by the forewing here) but this one has four, having two extra, small spots [photos by Mike Crewe]. 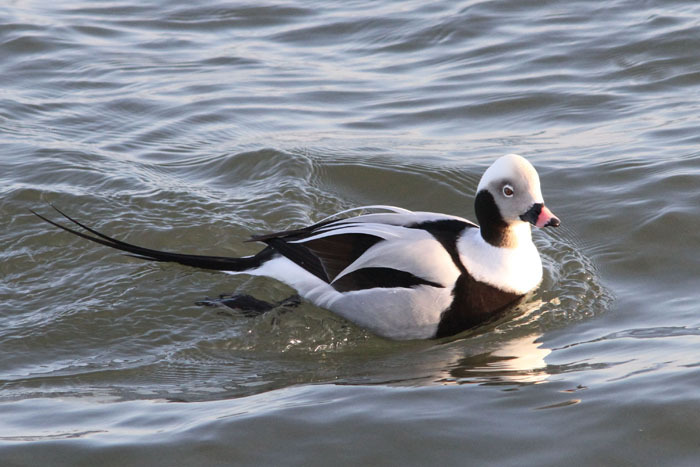 Bird sightings were on the up today as we head into a holiday weekend; the male Eurasian Wigeon was again on Lake Lily, as was a Cackling Goose and the female Common Goldeneye. The female Dickcissel continues at the Northwood Center feeders but there has been no news of the Harvard Avenue bird for at least a week now - though I hear there are no House Sparrows there at the moment so maybe it has moved elsewhere with the sparrow flock. Don Freiday reported an Orange-crowned Warbler and Common Yellowthroat in the state park today, the former where the red and blue trails split off, the latter further along the blue trail. 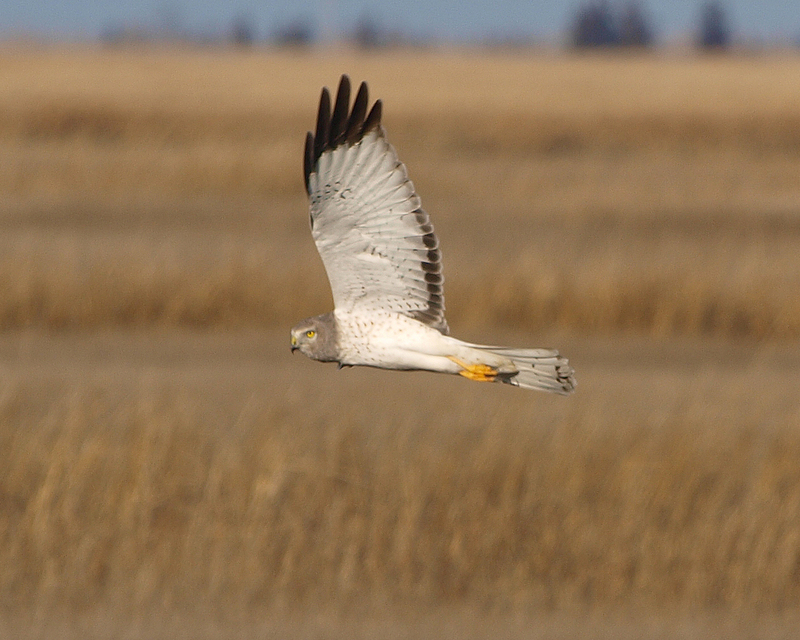 Don also heard a Dickcissel flying over so they are certainly in the news right now. I also heard a secondhand report of a Nashville Warbler in the state park this afternoon, which I guess is the same one that was reported a while back at the same location. The regular Glossy Ibis was on Lighthouse Pond at least in the morning and Will Kerling showed me photos of a Snowy Egret that he had photographed in Avalon this morning. At Northwood, the warming, sunny weather caused raptors to get up and test the thermals with at least nine Black Vultures, 10 Turkey Vultures, two Red-tailed Hawks and a Red-shouldered Hawk circling round and causing me to check the calendar...!! Well, we made it through the first day of the count and we didn't do too badly! Goshen's Rufous Hummingbird dutifully made it onto their list, though I hear the feeders were a little quiet today - so more help needed tomorrow! Down at the Northwood Center, we were let down by our Dickcissel today but I am sure she's still out there and just waiting to be found over the weekend - so come and give us a hand! Lake Lily gave us an edge with a few ducks that we could add to our list, uncluding the male Eurasian Wigeon which showed up late afternoon. I am sure this is the bird that turned up last fall but it has been so elusive of late that this is actually the first time I've seen it this year! 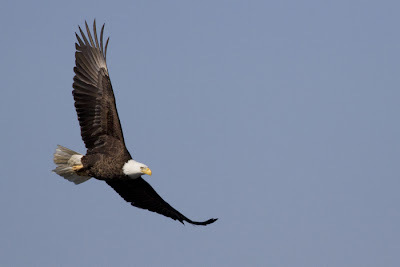 We finished the day on a high as an adult Bald Eagle cruised by just as Gail was about to turn the Closed sign on the door. 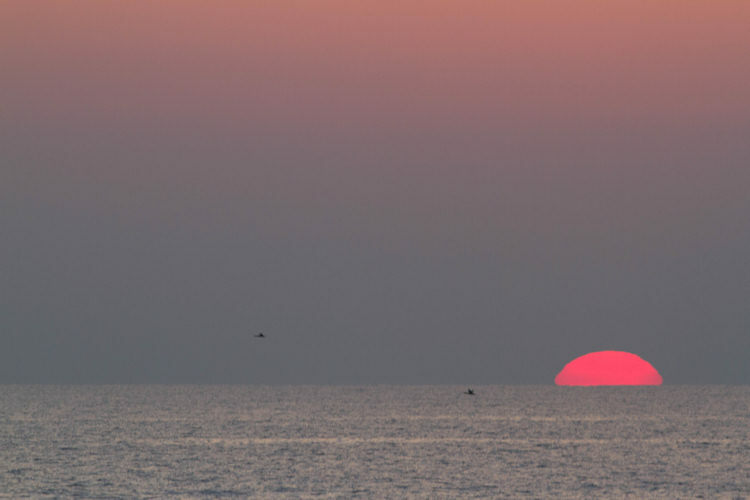 Tomorrow is another day! Not much news from elsewhere locally at the moment, though I did hear that Tom Reed had a Golden Eagle flying over Seashore Road in Erma on 15th and Tiffany Kirsten reported 40+ Snow Buntings on the South Beach on 15th. Right at the eleventh hour! 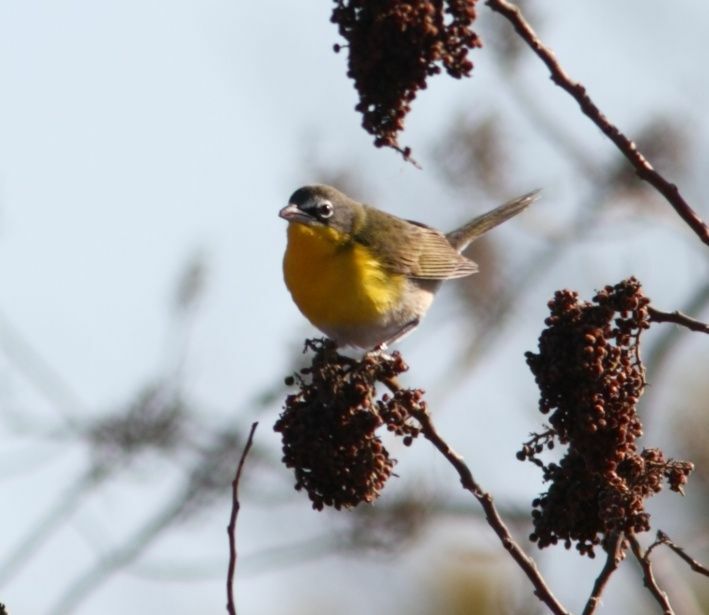 So here I am posting that our Dickcissel hasn't shown today and right at the last knockings she appears, just in time to get on the blog. Not the best Dickcissel photo in the world - but hey, it is at our feeder! This year's Great Backyard Bird Count (GBBC) is almost upon us and we'd like you to take part with us! This year's event runs from Friday February 17th thru Monday 20th and we shall be taking part on all four days at the Northwood Center and on the Friday and Saturday at our Goshen store. We will be running a list throughout the day, to record the maximum number of each species that we can see from the store - as per the rules for the count. Where do you fit in? Well, we have a store run! We can't be at the window all of the time and chances are we might miss the 'big one'! Seeing as the count goes on throughout the day, you can stop by for fifteen minutes, or you can stay as long as you like. 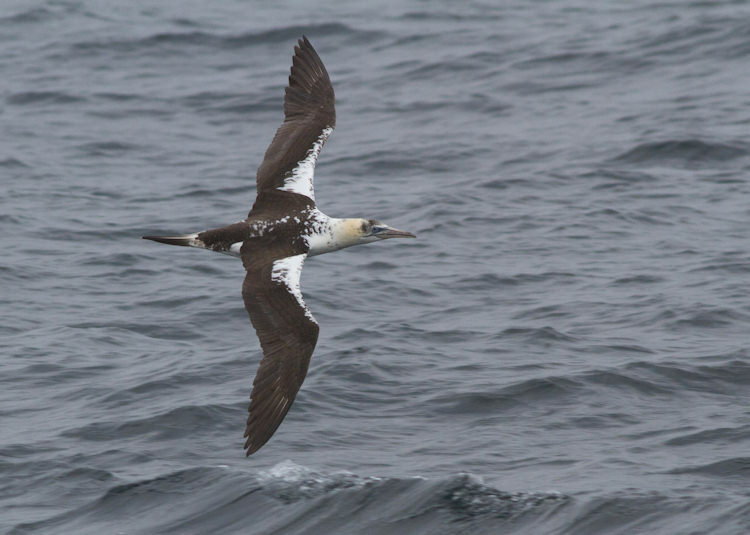 Either way, we'll have some fun and we will all be contributing to this huge event that takes place right across North America every year and provides a vital window into the distribution and population of birds across the continent. So come on down and get your name on the sheet and see if you can't get yourself a new bird for they ear! Right now, Goshen's Rufous Hummingbird is still hanging out, while Northwood weighs in with a female Dickcissel - who knows what else you might spot, especially as we'll have scopes set up so you can scan Sluice Creek or Lake Lily too! Get Out and Get Counting! 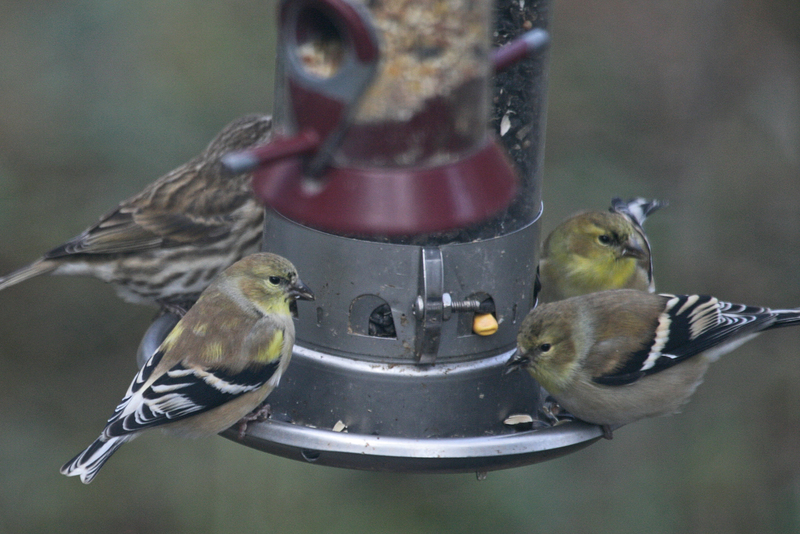 Birds are here at our store feeders, we just need your help to count them over the weekend [photo by Mike Crewe]. My last post, being titled 'Mild Weather Continues' seems to be somewhat at odds now as I look out of my office window at the remnants of the weekend's snow! Yes, these past few days have seen one of those nasty moments that February can through at you as a belt of cold weather whistled through our region - sadly just in time to hit all those who turned out for the Cumberland Eagle Festival on Saturday. The festival was a great day out though, despite the cold weather and, if we're honest, it could have been a lot worse! Eagles were there to be seen in good numbers and I saw endless smiling faces and heard many stories of great eable adventures on the day - the one that flew right overhead so close you could hear its wings beat; the one perched almost shoulder to shoulder with a Red-tail; the pair that flew out and put all the Snow Geese up. It was a great day out and personally, I also enjoyed watching a courting group of two female and four male Common Mergansers and ending the day with the cat-like silhouette of a Great Horned Owl, hunkered down on its nest but framed nicely in the scopes for those who came to the Owl Watch at Turkey Point. The Cape May hotlines have certainly been luke-warm this past week, but that is often the way in February. The Glossy Ibis continues to commute between the state park and the meadows and the male Dickcissel was present at Harvard Avenue at least at the weekend, though has been more elusive of late. The female Dickcissel continues to put in erratic appearances at the Northwood Center feeder and was last reported on 12th. Other recent sightings I have heard of by way of email include an American Moorhen at the South Cape May Meadows on February 7th and a Pine Warbler at Jake's Landing Road the same day, both reported by Derk Visser. I also just heard of an Osprey at the Meadows, reported to me just a few moments ago by Bob McClennen. All interesting sightings and all indicative, I feel, of the generally mild winter we've had - in stark contrast to the snow in North Africa!! This Nashville Warbler was originally found at the Mauricetown Bridge by Tom Reed on our Wintering Eagles, Hawks & Owls workshop in late January and was still present on Februarly 10th at least. Michael Flemming did a good job capturing this image of it during our second workshop on February 9th, as it flitted ceaselessly through the riverside vegetation. 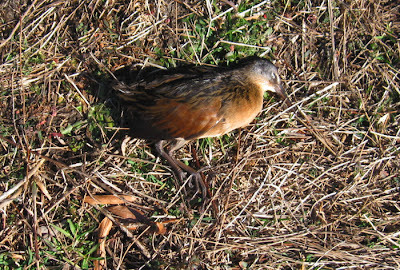 James Cremer sent me this photo of a freshly dead Virginia Rail at Green Creek on Monday. 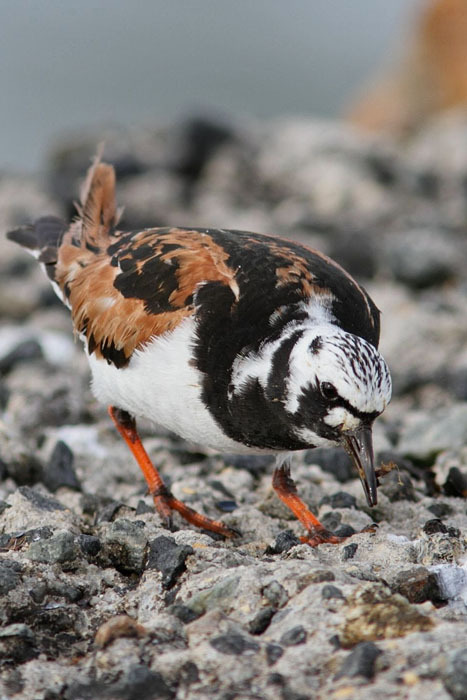 Sadly, sudden freezes like the one we just had can be bad news for wetland species that struggle to find food when their habitats become temporarily inhospitable. Just a few days left for you to book a place on our Longtails in Love walk this coming Saturday - I thought it was appropriate to mention it on St. Valentine's Day! 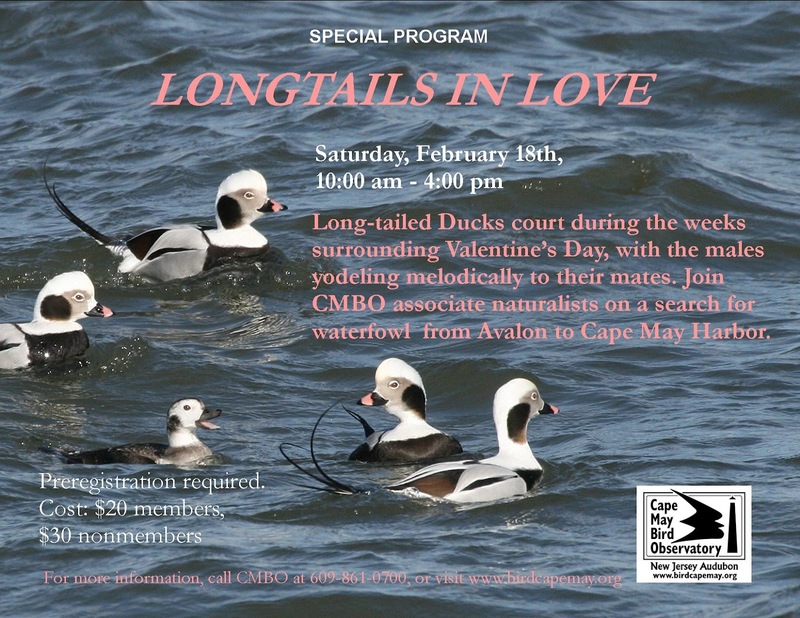 Long-tailed Ducks are at full cry in the backbays and inlets right now and I really would recommend a visit with our great team of naturalists who know all the best places to find these and all the other ducks that are cooing and getting jiggy with it right now! 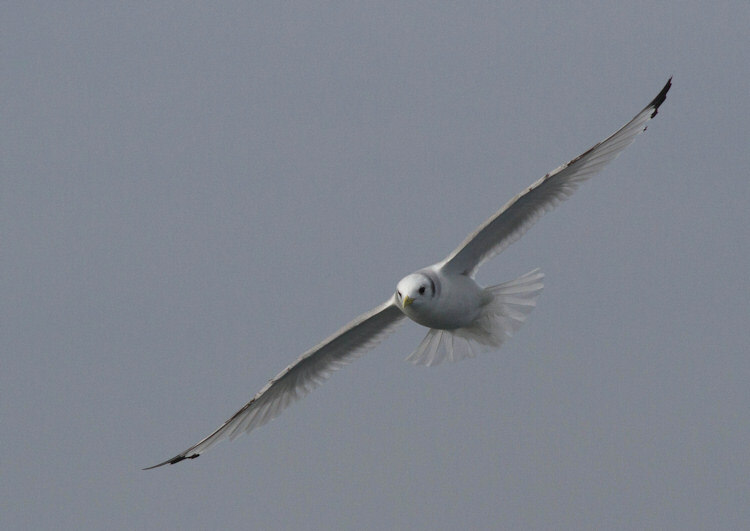 The mild weather that has been such a feature for us this winter continues - and continues to provide us with quirky bird sightings! The single Glossy Ibis continues to be reported on odd occasions from either the state park or the South Cape May Meadows, but probably spends much of its time in those little tucked away corners that we can't get to. The Cackling Goose also continues to commute between Pond Creek Marsh and Lake Lily on a regular basis with the local Canada Goose flock and our local pair of Bald Eagles seem to be on regular sorties around the point, stirring up the ducks at the moment. I have to say, they do seem restless at present and currently don't seem to be thinking of settling down on a nest - but there is still time. 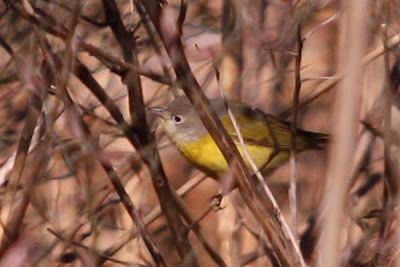 At least one Orange-crowned Warbler continues at the state park, usually seen on the red trail or on the first 100 yards or so of the blue/yellow trail. Subtle plumage differences suggest there may be a minimum of three different Orange-crowneds in the state park at the moment. On the 4th, Glen Davis came up with the latest surprise bird of the season with a Brown Pelican which settled for a short time on the water just off St Peter's, before heading off east. 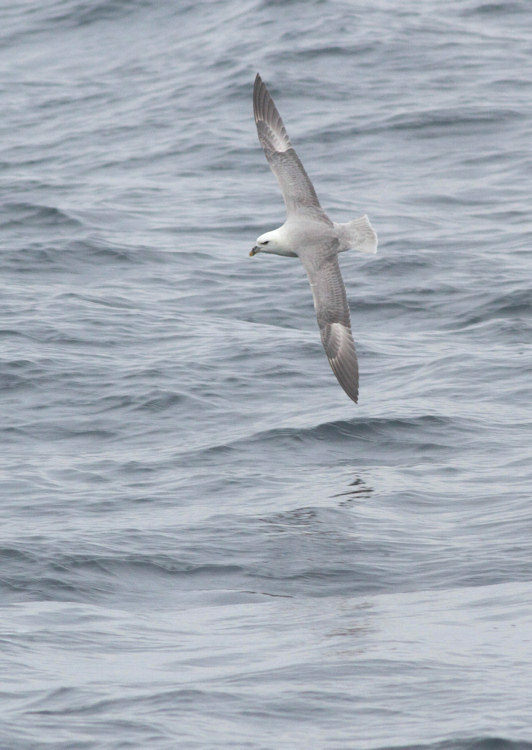 Almost exactly an hour later, Dave Lord reported what was presumably the same bird off North Wildwood, heading back south. I've heard of no further sightings so far. 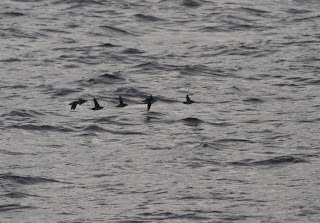 A large influx of Razorbills off the coast of North Jersey seems to have just about trickled down to us with one or two sightings locally of this species. Most notably, Dave Lord reported one on the channel to the west of the toll bridge at Nummy's Island on 4th and three birds were again reported from Townsend's Inlet on 5th. 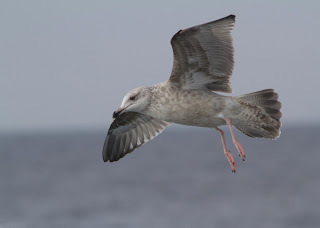 This is an annual winter visitor off Cape May but appearances are unpredictable and often involve birds simply passing by offshore, so if you are looking for one, you need exactly the right combination of luck and patience! Finally, the female Rufous Hummingbird continues to entertain visitors to the CMBO store at Goshen on route 47, to February 7th at least. Will Eurasian Collared Dove finally stay and breed with us? The three birds that turned up last year are still hanging out along Whilldin Avenue, so it seems we may soon be adding Cape May to the long list of sites conquered by this tenacious species. This great photograph of a male Northern Harrier was taken at Nummy's Island on February 3rd by Sean McDermott and is a wonderful study of the 'Gray Ghost' in action. Nummy's Island offers excellent opportunities to bird from the car in the winter and, if you are really lucky, you can get opportunities like this! Saturday February 11th is the day of the Cumberland Eagle Festival and we look forward to seeing you there! We will be there with a CMBO stand at the Mauricetown Fire Hall, as well as having our team of great volunteer leaders available at the four eagle watchpoints throughout the day. Do come along and enjoy a great day out - there's even indoor lectures to go to if we get a short burst of rain. See you there!! 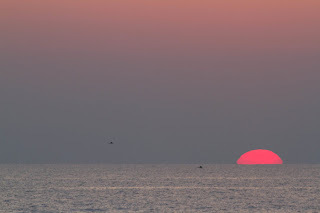 Cape May pelagic a rousing success! [All pictures copyright by Tony Leukering. Click on image(s) for larger version(s). 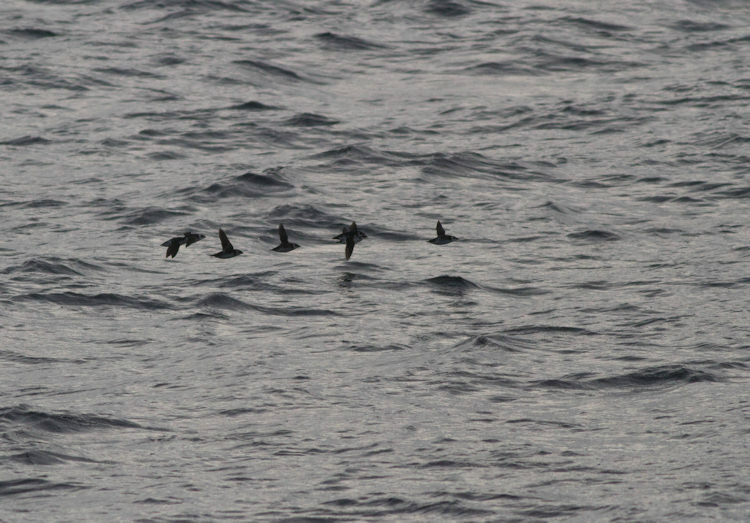 Yesterday's pelagic trip, organized by See Life Paulagics was superb. The trip was conducted on the Starlight Fleet's Atlantic Star, a very comfortable 110' head boat sailing from Wildwood Crest. An auspicious forecast had everyone excited for the possibilities and, though the weather turned out not as benign as forecast, expectations were met. And surpassed! Departure in the pre-sunrise hours (at 6:06 am, if you must know the precise time) had us on the ocean by the time the sun came up, heading a bit south of ESE to a temperature break (a meeting of water masses of different temperatures, which often concentrates food resources, thus the birds that take advantage of such) about 32 miles out. 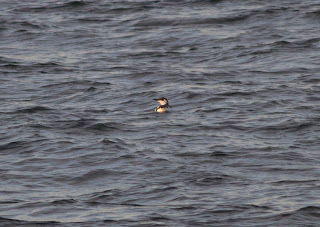 Even before the first smidge of the sun was in view, flying Red-throated Loons and all three species of scoter were being counted. 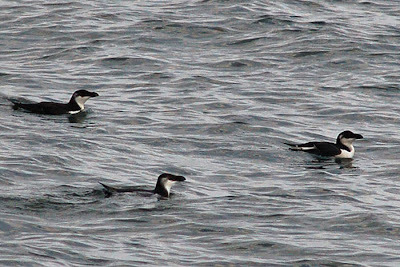 Razorbills were also quickly added to the day list, with singles and flocks being encountered frequently in the first ten miles outbound. Once well out at sea, a few Herring Gulls encouraged us to finally initiate chumming with bread, beef fat, and fish parts, which eventually got us a horde of ship-following gulls and Northern Gannets vying for scraps. ... and this light-morph Northern Fulmar (12+ on trip). 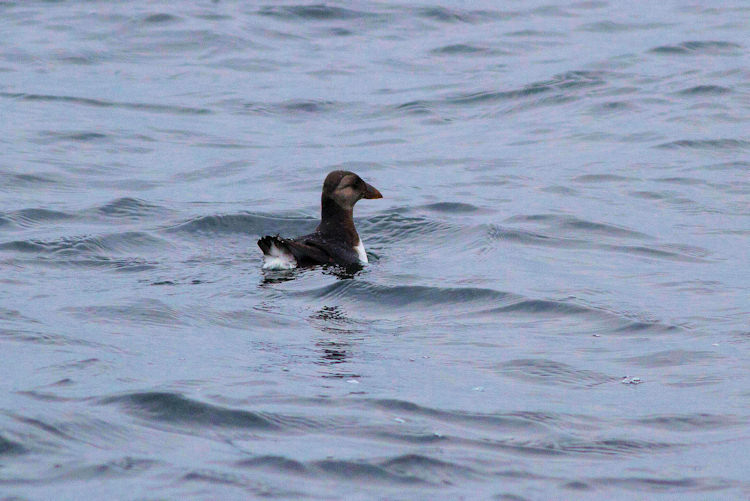 ... and, most importantly, Atlantic Puffins, of which the trip total was 18! 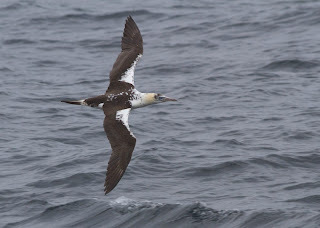 It is hoped that five or six more pelagic trips will be conducted this year on the Atlantic Star, including the one during the CAPE MAYgration event in mid-May; details for all will be announced on this venue and, perhaps, we'll see you there! Well, whilst I was up enjoying the delights of coastal Massachusetts in February (Snowy Owl, Northern Shrike, Black Guillemots, Razorbills - you know the kind of thing!) with some of our wonderful volunteer field trip leaders and assistants, it seems that Cape May birders were out and finding all sorts of things. Here's a summary of the past few days since my last post. 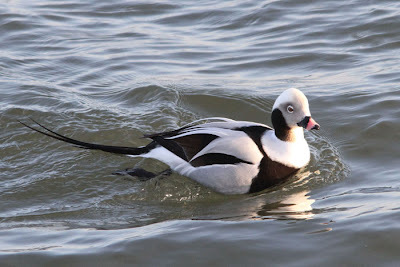 February 1st saw a Black-legged Kittiwake reported by Glen Davis off Sunset Beach, two Palm Warblers noted by Will Kerling at the Cape Island Preserve and a pair of Harlequin Ducks found by Gail Dwyer by the southernmost stone jetty at Stone Harbor Point. 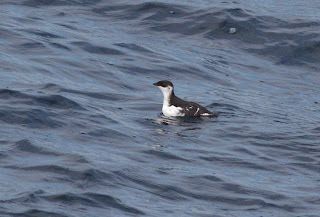 A couple of hours later, the two Harlequin Ducks - or perhaps more likely another pair - were at the 8th Street jetty in Avalon and a Razorbill was also present there. Of greatest interest to local birders will be the report of a Western Tanager at Cape May Point State Park on February 2nd and a further report from the same site today. The report today came from the western end of the blue trail near the metal bridge, not far from where the trail breaks off from the red trail loop. 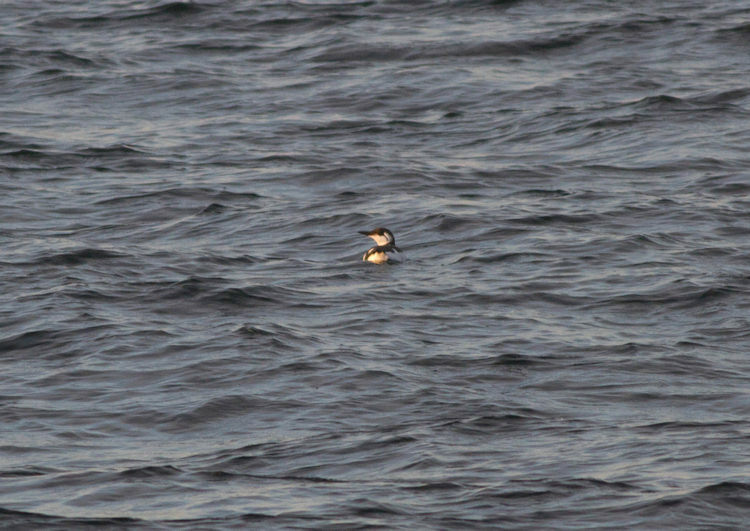 This is presumably the bird first seen at the point on January 25th. The relatively mild winter continues to turn up birds that one would normally expect to be further south at this time of year; a Glossy Ibis at the South Cape May Meadows, Little Blue Heron at the Coastguard Ponds/Two-mile Landing area and a male Blue-winged Teal at the state park are the most recent hangers-on to be reported. Up to seven Green-winged Teal have been in the meadows too, most recently reported by Will Kerling on January 22nd. In stark contrast is the almost complete absence of what might be considered 'hard weather birds'. Glen Davis mentioned a couple of fly-over Common Redpolls at the state park a few days ago which remains a very rare bird this far south this winter. Records reported to ebird for this year so far show just two sightings in North Jersey and a couple of singletons to the south of us on the Delmarva Peninsula. Similarly, last winter's glut of Pine Siskins is in stark contrast to a mere five reports this year so far for New Jersey as a whole and I only know of two reports from Cape May County - thanks to an email from Cynthia Allen in Cape May Court House, who had one at her feeder on February 2nd. 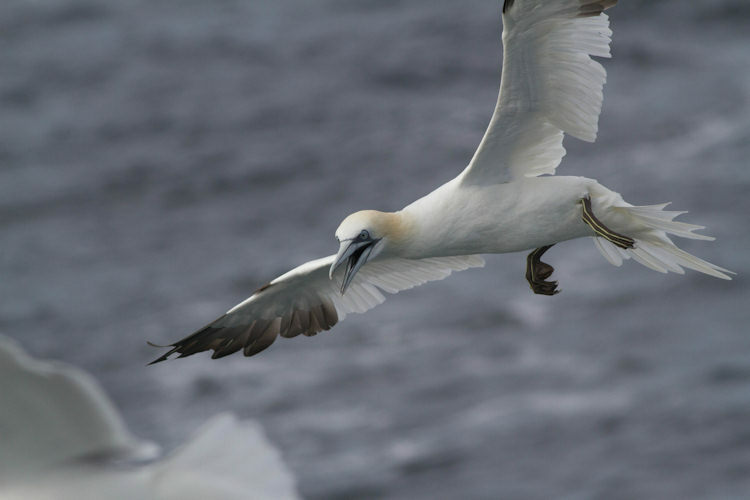 Such short-term trends are the norm for birds that move in response to food availability and mean very little at the local level. This is where adding your sightings to the bigger picture via ebird come in handy - so don't forget to get on line!! 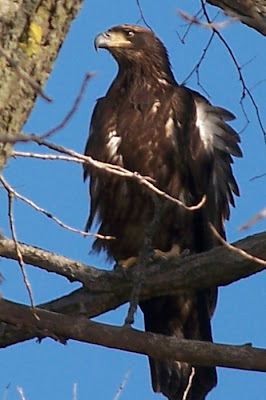 Debbie Hudson got amazing views - and photos - of this young Bald Eagle at The Beanery recently. 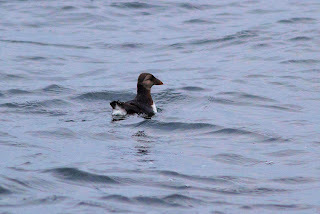 Its dark brown underparts show it to be a bird still in its first cycle of feathers and thus likely to be one of the three youngsters that fledged last year from our south-of-the-canal list. 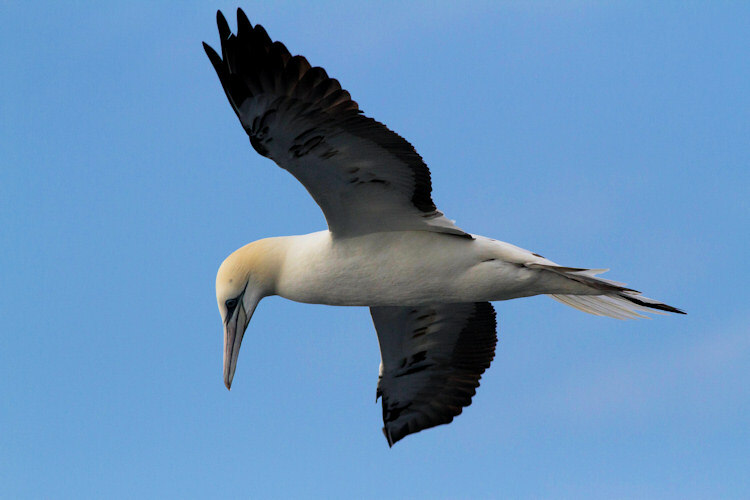 Learn more about bird molt and plumage on our workshop on this very subject in August.